We Recommend to arrive in Cusco at least one day before your tour to Machu Picchu starts as the trains leave very early from Cusco. Cusco is located at 1600 km. south east of Lima (Peru). there are only two waya to reach Machu Picchu from Cusco , one is using the Train Companies (Peru Rail and Inca Rail) and the other is hikking the ancestral "Inca Trail" either in two or four days, this package only includes the train options. we pick you up from your hotel in the city of Cusco 1 hour before the departure time of your train and take you to the train station located in the little village of Poroy (30 minutes), then get on board the train of the company "Peru Rail" and begin the journey from Poroy (Cusco) to the town of Aguas Calientes (2000 m) which takes four hours. We will arrive at the station of Aguas Calientes and will be able to cross the village of the same name, take some snack and wait until 11:30 hrs to go to the bus station, to ascend 400 m of height, by a zigzagging road for 30 minutes until arriving To the incredible world wonder "The Sanctuary of Machu Picchu", known as "The Lost City of the Incas". The guided tour starts at 12:00 noon and on arriving at the same citadel of Machu Picchu we will pass by the control where you will deliver your ticket, from this place will begin the guided tour, visit the main areas of the City such as: Main Square, Circular Tower, Sacred Solar Clock, Royal Rooms, Temple of Three Windows and cemeteries, the guided tour will be for more than two hours. At the end if you want to have lunch at the Hotel Santuary Lodge, another option you have is to return the town of Aguas Calientes and take their food in one of the many restaurants. (Lunch is not included inside the package). In the afternoon you will take the train back (present at the station 30 min before the departure time of your train), the return will follow the same route as the one-way trip, upon arriving at the train station, we will be waiting for you Take it to your hotel. The quickest and easiest way to visit Machu Picchu.On the trip you can enjoy delicious snacks hot and cold drinks It has been .recently refurnished , equipped with panoramic windows on its roof , passengers feel they are part of the stunning scenery of the trip enjoying a spectacular view with unparalleled scenic views and wonderful photo opportunities. 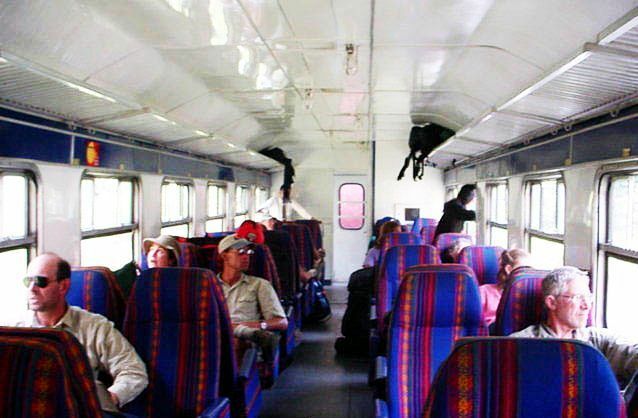 Designed exclusively for travelers with adventurous spirit who seek comfort and safety.The service Expedition have seats featuring Inca details , giving them a local and indigenous flair and the comfort of having a broad space for your backpacks you will enjoy enjoy Machu Picchu.for sure , This service will serve drinks and snacks at an additional cost. 33 06:40:00 hrs 09:54:00 hrs. 84 18:20:00 hrs. 20:05:00 hrs. The train leaves from Cusco in the morning, starting a spectacular journey through changing landscapes while passengers enjoy a delicious brunch.After climbing a steep slope on the outskirts of Cusco, the train descends into the Sacred Valley, passing lush fields and colorful villages located at the foot of the Andes.It has 02 passenger cars, a bar car and a kitchen car. The car design is exquisite and luxurious, extra-wide tables of almost 3 meters long and comfortable seating 30 cm wider than others in the same way, these cars are among the most spacious and comfortable in the world. NOTE: In case of lack of availability is used other trains of other times, this provided there is availability of the rail company, if that were the case, take the train from Ollantaytambo to "Aguas Calientes", and the return will be of "Aguas Calientes" to Poroy, our agency will also transport Cusco - Ollantaytambo and Poroy - Cusco. Transportation to the train station. Round trip Train Ticket Cusco-Aguas Calientes (Machupicchu). Reception service at the train station of Aguas Calientes. Round trip bus tickets from Aguas Calientes to Machu Picchu. Transfer from Machu Picchu to Aguas Calientes. Return train ticket from Aguas Calientes to Poroy. Transfer from the train station to the hotel. Transportation from train station to hotel. * Information session -Briefing (one day before). Wear light shoes or tennis.